Use language that signals change: By choosing the name Francis, the pope needed to use only one word that, for Catholics, carries huge symbolic meaning. St. Francis of Assisi is known as a reformer, rebuilder, and one who gave up his wealth to focus and live with the poor. It was a name many considered no pope would ever consider taking. 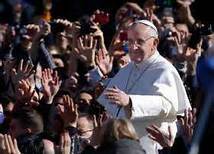 Let the people most impacted know they are important: When a pope is elected, the first thing he does is meet with his direct reports (the Cardinals) and others in the Vatican who will support him during his tenure. After meeting with the Cardinals, he asked the others if they would be their for a while. When they indicated they would, he let them know he’d come back and talk with them later because the people had been standing in the rain waiting to see him and he didn’t want them to wait any longer. He knows these are his stakeholders and he is there for them. Listen before you speak During his first address rather than providing a blessing to the crowd in St. Peter’s Square he asked for them to bless him. Rather than speaking, he chose to listen. Show those you are leading you are, in many ways, just like them: Within the 24 hours after becoming Pope, Francis indicated he was the same guy he had been. He went back to where he’d been staying on the bus with the other Cardinals. He showed up at the hostel the next day and paid his bill. He want to a local church, giving them 10 minutes notice, and then crossed the street to say hello to some school kids and people on there way to work. Too many times, leaders give off signals that they are different from everyone else and that he or she is separate from the others who will be impacted by organization change. Making Change Love Change? Not so much.